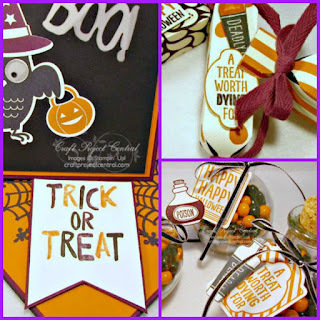 Just Julie B's Stampin' Space: Happy Howl-o-ween to You! It’s time to decorate for Halloween – a most fun holiday! This can be a fun time of year for the fun little treats you can leave on your co-workers’ desks or give to your child’s classmates and teachers. And what better time for a little fun than Halloween!! J This collection encompasses a fabulous Twisted Easel card decoration and Halloween treat gifts perfect for anyone in your life. This project uses the wonderful new Howl-o-ween Treat Stamp Set, coordinating Boo to You Framelits set, the new Sweet Hauntings Stamp Set, and our fabulous Envelope Punch Board to create some fun goodies. This cute project was made by Wendy Klein, and you can get her tutorial when you subscribe to the month of October over at Craft Project Central.